Ron M. with Romanian student Maria N.
One of the qualities I enjoy about tennis is its international flair. On any given week, events are being played by athletes FROM every corner of the world–seemingly IN every corner of the world. Even so, my experience with such events happens in front of various kinds of video screens right here in South Jersey. But recently, I was fortunate enough to have a little of the outside world brought to the tennis courts in Gloucester Twp. Back in May of this year, I received an email from a local resident explaining his wishes to provide tennis lessons for his 10-year-old niece who would be visiting from Galati, Romania. Maria Nazarov has been training in tennis since the age of 4, and her parents were concerned with having her miss several weeks away from the court. This prompted the initial email asking if I would take on this international student who spoke very little english. 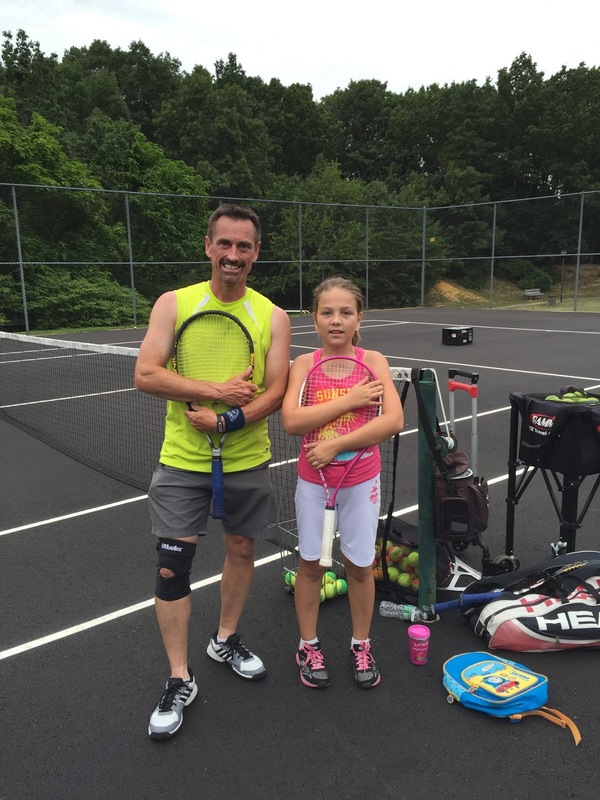 I saw this as a wonderful opportunity for both of us, and I was anxious to see just how this student would perform since my students typically are either beginners or those with limited developed tennis skills. My wait until she arrived, around mid-June, was well worth it. This wonderful young lady wasn’t that much unlike other american pre-teens I had met with two exceptions: first she understood very little english and I sometimes struggled to explain an activity, and second, her tennis technique and understanding of the court was the best, of anyone her age, I had ever worked with. It was a joy to meet her on the court and trade groundstrokes, volleys, and even point play. As the instructor, my role is always to encourage and provide both positive and constructive feedback. In addition, my function should be to stretch a student to achieve the most from our time together without setting the bar so high as to discourage. From the feedback I received on the court, mostly conveyed by non-verbal smiles, I felt our sessions went well. Maria’s uncle confirmed this with me by email–sharing that she will no doubt have fond memories of our training–as she prepared her luggage to begin the long journey home to Romania. What I take away from this experience is the concept that tennis is tennis no matter where it is played. I may never make it to Galati in my lifetime, but I will treasure the experience I had in helping maintain the formidable skills of a very respectful and hard-working young lady from a land far away. I wish Maria all the best, and I am grateful to her uncle Daniel who sought me out to play my small role in her life on the courts in Gloucester Township.